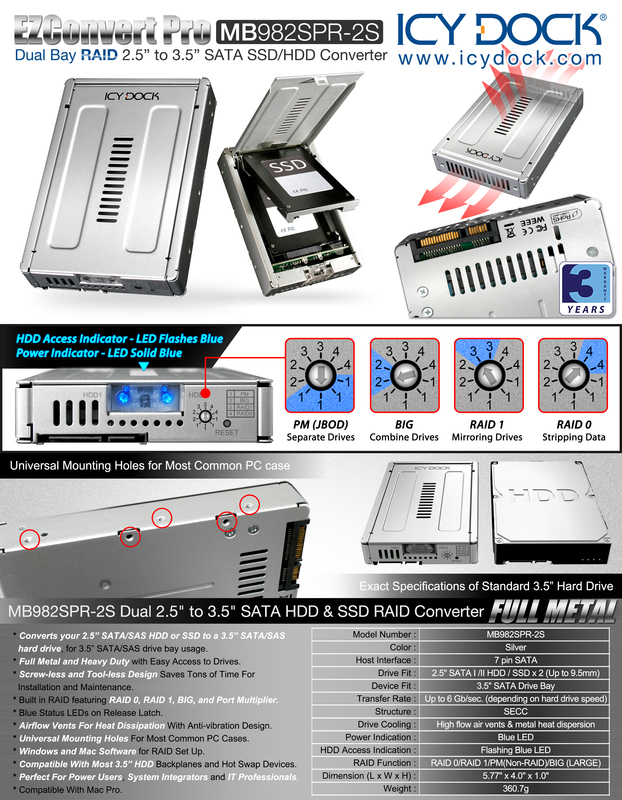 Icy Dock is a household name for its high quality storage products for RAID applications, SSDs, and functional design. Now, all of those will be combined into one ground breaking product: the EZConvert Pro MB982SPR-2S. This little device packs a huge punch with features and performance, allowing 2 x 2.5” SATA SSD/HDD to be converted to a 3.5” SATA form factor for use in most internal drive bays, backplanes, external enclosures, and server racks. It transforms the 2 drives into a 3.5” SATA drive with exact dimensions, mounting holes, and connection locations as a normal 3.5” drive. The device uses a full metal construction for durability and drive protection, especially for use in industrial computers and servers, as well as military systems deployment. Inside the case there is room for 2 x 2.5” SATA SSD or HDD fitting the standard 9.5mm drive heights. Like our previous converters, the door mechanism moves a tray to connect and disconnect the drives as the door is closed and opened, respectively. This provides the user with peace of mind that the connection is solid. Also, similar to the previous converters, the installation process is completely screw-less and tool-less, saving the user time when first installing the drives, as well as any necessary maintenance throughout the product’s lifetime. On all sides of the box are airflow vents to provide adequate ventilation to the 2 drives inside, ensuring they operate in an optimal environment. On the door latch are 2 blue status LEDs which provide the user with drive activity, power, and RAID status. The RAID controller gives users the option to choose RAID 0, RAID 1, BIG, and Port Multiplier mode, and it can be configured via software that is compatible with both PC and Mac systems. This allows the unit to be configured for blazing fast speed, system drive mirroring, extra storage, or just an easy way to dual boot a computer.